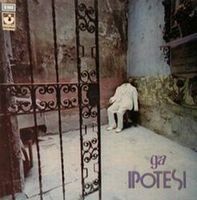 I really like this album, the only release from Gruppo D'Alternativa. They're clearly influenced by a lot of my favorite prog bands, especially Gentle Giant, Genesis, ELP, King Crimson and probably some of the Canterbury bands. The compositions are very interesting, complex and ambitious, with lots of changes and sections....and the musicianship is outstanding. Really top-notch. The keyboardist is especially impressive and seems like he could hold his own against Keith Emerson or Rick Wakeman. There's also a lot of very nice flute-playing, and also, believe it or not, bassoon. I love the musical range of this band. Some song sections are classical-sounding, others straight prog, and then there's the parts where they just get wild and jazzy and free. It's perfect music for people like me with attention-deficit disorder and insatiable musical appetites. The only weak point is the vocals. The singer does not have the most beautiful voice. In fact, it's a bit irritating in a kind of whiny way, but I've actually grown to like it. I can see how the vocals would keep some from loving this album, but not me.